The 3M™ Scotchlite™ Reflective Material Safety of Life at Sea (SOLAS) grade products are intended for reflectorizing SOLAS life support equipment such as life vests, jackets and rafts. 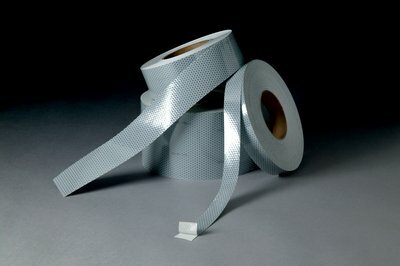 The 3M™ Scotchlite™ Reflective Material SOLAS 3150-A is fitted with a pressure sensitive adhesive. When properly used, 3M™ Scotchlite™ Reflective Material helps enhance wearer visibility at night time or in low light conditions when illuminated by a light source by returning the light back toward the original source. The 3M™ Scotchlite™ Reflective Material Safety of Life at Sea (SOLAS) 3150-A includes a SOLAS-A symbol and a ship’s wheel, in a repeating pattern, in order to identify it as material designed for use in SOLAS applications according to the International Maritime Organization (IMO) Res. A 658 (16).